Playing as a Mage requires using lots of dodge rolls to avoid enemy attacks. Accuracy might be a problem at the moment, but this can be compensated by pointing your character towards your targets right after a dodge roll and before attacking (this will avoid hitting nearby breakable objects). As much as possible do not get hit and if ranged enemies are around, always move after releasing your first normal attack to avoid their attacks. - Always remember, a higher Lvl gear is always better in terms of base stats (Health, Armor and Int), regardless of their rarity or grade. - Hero Lvl 10: Any will do. 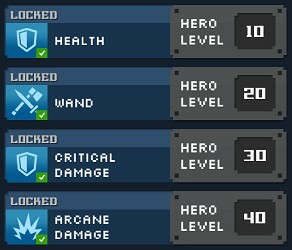 - Hero Lvl 20: Wand, but Staff is ok too, your choice. 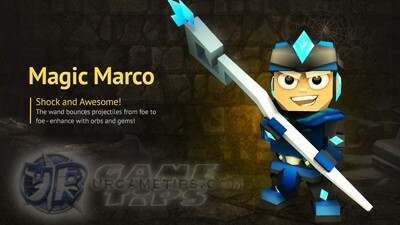 - Hero Lvl 40, Any will do but preferably, go for either Fire or Arcane if this is your first hero. Why? because both are under the Path of Illumination (INT+), a talent path suitable for Mages. - Happens, but only revive up to 3 times using Souls, above that will require 1000 Souls then 10,000 Souls so better give up. Roll what you can and continue, at least get a Wand or Staff. - All Paths to Lvl 1, then upgrade Path of Illumination to Lvl 5 > Path of Mastery Lvl 3 > Max Path of Illumination > Upgrade Any next to help your other heroes. Note: You can do a lot of combinations from here on, check below for examples, mix and match to find what is suitable for your playing style. DoT Trapper Skills: Nice once you have high damages and at least Lvl 2 upgrades.